About a year ago I had gotten a roll of acetate from a restaurant supply because I knew that one day I wanted to make transfer sheets. That day was yesterday. I just wanted some opinions, though I'm pretty sure I just made the cocoa butter layer too thick. I really layered it on there, it was two colors, probably like 5 or six thin layers with a pastry brush. When it came time to cut down the strip, I had to be very delicate with it, otherwise the cocoa butter would peel right off the acetate. Anywho, I had previously made a mango caramel, so the transfer sheet was going to be orange and yellow. 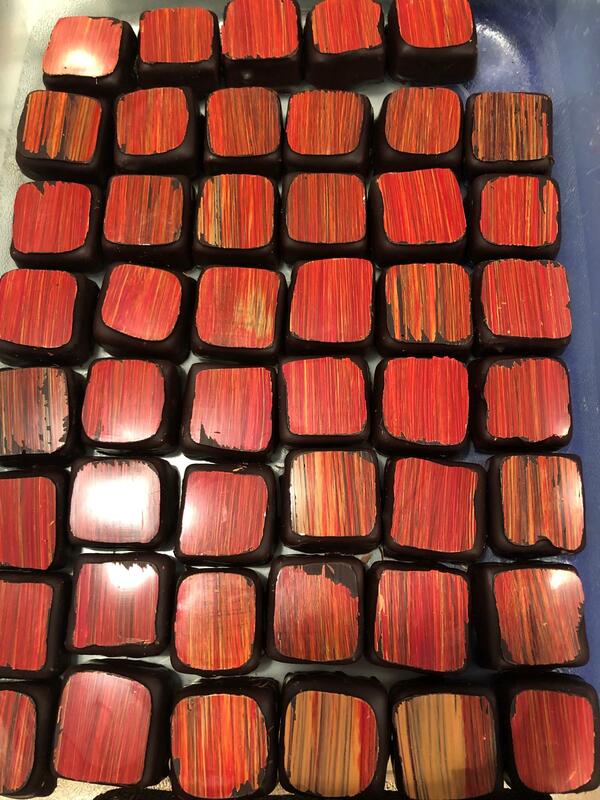 The first image is most of the bonbons with their beautiful jagged edges. 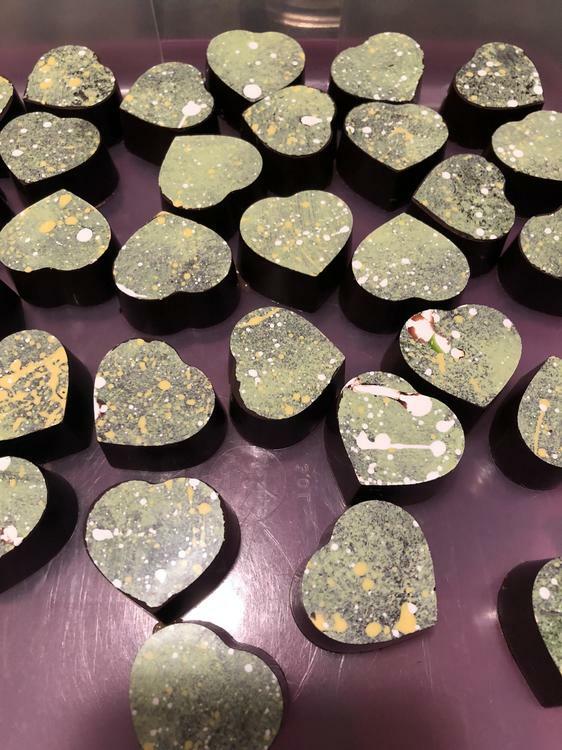 Really, on most of the bonbons, all the cocoa butter came off the acetate in a giant square, so i had to break the edges down to fit the top of the bonbon. The second picture is a close of another pattern I did, I just spattered cocoa butter with a toothbrush. That transfer seemed to work as intended, the peeled right off, nothing weird. I know the color could be more intense, but that's something I can fix. As for the other bonbons, is it a case of just too thick of a cocoa butter layer? I suppose I could intensify the color and go thinner, perhaps with an airbrush, but for now I'd like to just do some simple transfers. Any comments are appreciated! I had exactly the same problems. I bought guitar sheets from Chef Rubber, the flexible ones. But anytime I added a second layer of cocoa butter (or even made a single layer a bit too thick), flaking began, and I almost gave up (still intend to try again this coming summer). I can't imagine airbrushing a layer on since it is so difficult to control the flow of cocoa butter from an airbrush, but I will give that a try as well. Anytime I have tried airbrushing a layer of white onto a purchased transfer sheet (to make colors like red show up on dark chocolate), that has also been a mess. Yeah, you want to do the cocoa butter quite thin...several layers with a brush will usually be way too thick...a nice thin layer with an airbrush works great. See if you can get a hold of some professionally printed transfer sheets and see how thin they are for reference. Also you mentioned acetate...if it is anything like the kind of stiff foils they also sell for overhead projectors at office supply stores then I would stay away from those (even if you got yours from a restaurant supply, sometimes they sell the wrong kind also)...you want to get the thin, soft, flexible plastique sheets...kind of opaque...often referred to as guitar sheets. I checked Chef Rubbers site, it lists guitar sheets as being 5mm thick. I was looking for the thickness of the Kopykake roll I have, but wasn't able to find any mention of the actual thickness, but I dont think its too far off. 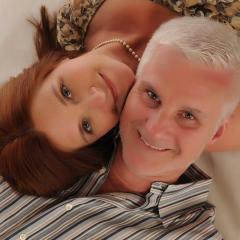 I'm going to try again soon, and make sure my color is more intense and spread thinner. So heres two more attempts. The first, I just made some designs using thinner layers, but didnt adjust my color. The second, I adjusted my yellow so its more vibrant and opaque, so that was much more successful, but I have noticed that its sort of hit or miss with the transfers that I used a pastry brush on, some come off the edges cleanly, but some don't. Overall, I've seen that my best transfers are ones where I made a design with cocoa butter that didnt really overlap much off the edge of the bonbon. I was also surprised that the random spatter especially came out well. Anywho, thanks for the tips guys, its appreciated. Thanks for the link, I'll check that out. By chance, would a wood grain tool work, or would that be too thick? I personally have never used one, but it's been one of those random items that always catches my eye. The discussion of wood grain reminded me that Jin Caldwell demonstrated making wood grain transfer sheets at the 2017 eGullet workshop in Las Vegas. I asked other attendees if they had a video of her technique, and a video was posted on May 22, 2017, on the Facebook workshop page. It's difficult to find that particular posting in a very long "page," but I just found it again. Jin used a spatula held at an angle to make the chocolate (yes, she was using chocolate) as thin as possible. I had forgotten, but I tried her technique after returning home but had cracks (which she, of course, did not). The overall problem I have with making transfers is that you never know how they are going to turn out until it's too late. I tried posting a link to that video, but (maybe because it's in a "closed" group) it doesn't work. This is in Response to Jim D from a different thread in which he recommended I post my response regarding transfer sheets here. I am testing different methods and you are correct Jim, making your own transfer sheets come with some heart ache! When I used them in my magnet mold I had good turnout. prepared them first by cutting to size then adhering to my acrylic boards, I treat the acetate like a chocolate mold and buff it before painting. Then I will splatter them, sponge them and/or paint them. I do not move them until I am ready to insert them into the mold because I find that moving them causes the cocoabutter to separate from the acetate. I let them cure for over 24 hours prior to use. I also found that when removing product from the magnetic mold it is best to remove the transfer sheet FIRST by gently peeling it from the mold then release the chocolates with tapping because if I release the chocolates first the cocoabutter cracks off the edges of the product and creates irregular product that must be eaten immediately before anyone can see my errors! 🙂 . My final product was pretty good in the sense of little wasted or damaged product. I have a photo but the lighting is not good but you can get a sense of the outcome. 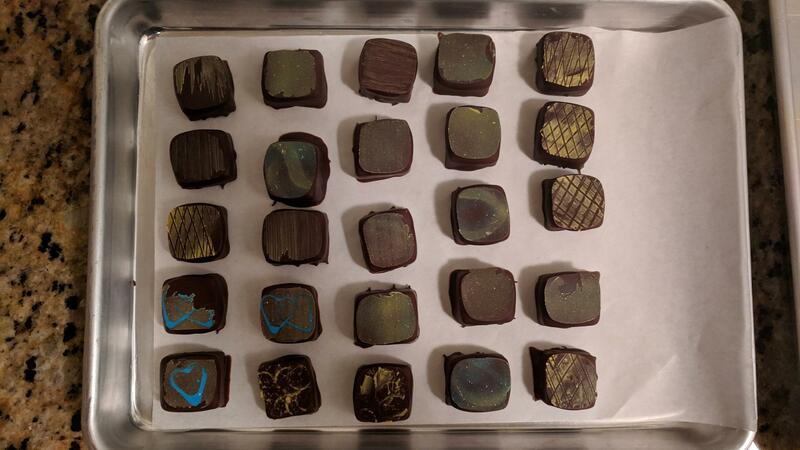 Last night I tried the same transfer sheets but cut them into smaller squares and pressed them on the top of my white chocolate tahini squares and that was not nearly as successful as using them in my molds. I have enclosed a photos of those, they are the red and orange painted ones. Several areas on the edges that the cocobutter did not release from the sheet to the chocolate and I am thinking it may be because I did not firmly press them enough while the chocolate was at the proper temperature? I know the cocobutter was not very thick in comparison to my molded green and yellow splattered hearts so I believe it is the application. Another difference was the green hearts I chilled for 15 minutes in the fridge whereas the hand dipped squares I let rest over night. I did a test one hand dipped product in the fridge and it worked well after I pulled it out and rubbed my warm finger on the top of the sheet before removing! SO is it chilling, pressure and warming prior to removing that is key????? 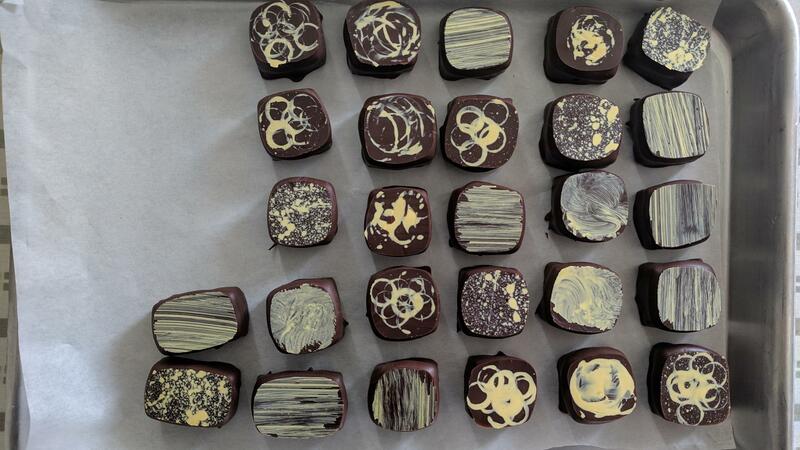 If I had more time to spend on this I would but I think I will do better to switch to a square or round bon bon mold then cut my sesame base and adhere it to the bottom of my cocobutter molded chocolates filled with tahini ganache? This looks like something @gfron1 could help with. I believe it requires fried chicken. For those who don't understand the reference, here is a picture of the newly-painted wall at @gfron1's soon-to-open restaurant, Bulrush. Fried chicken was part of the work crew's meal. I think these chocolates have a gorgeous pattern, just as that wall does! For those who don't understand the reference, here is a picture of the newly-painted wall at @gfron1's soon-to-open restaurant, Bulrush﻿. Fried chicken was part of the work crew's meal. Thanks Smithy for the kind words, I am happy the way the colors and the texture turned out but feel I need to find some assistance in setting technique for transfer sheets with hand dipped squares. I would like them to have a more consistent shaped finish. Possibly my pressure is different with each placement? Also its time consuming so the chocolate seems to get overly seeded in the period of time it takes me to complete the process.